When you're on vacation, your body tends to accumulate grease (from eating junk and drinking too much). So, we have created a bike tour that will take you through the best spots, to help you burn off that lard. This tour is a 3 hour submersion into graffiti and street art, visiting sections of the city, that your parents would tell you to stay away from (especially if you're in your 60's). 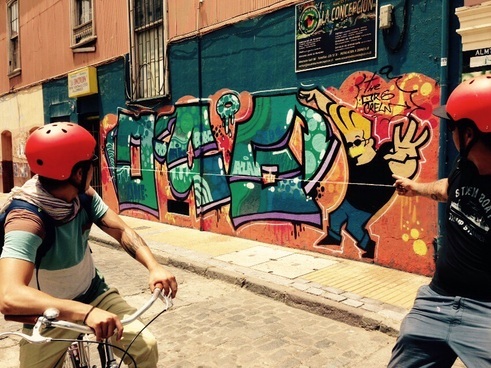 Join us as we ride through Valpo, and hear some great graffiti & Street Art stories. Come on... it's a bike tour -- children love it. It's one step down from a water-balloon fight tour (coming soon). Look for our guide in the Valpo Street Art Tours Shirt or VSA Identification. *** Our bikes have names and they expect to be called by them. The tour is about 3 hours long. - Shared Tours have a minimum of 2 participants; If you're a Solo Traveller, you can take the private version of this tour, that way you don't have to pay for 2 shared slots.